Grid-connected microgrids are considered the future of a smarter electric grid. So as large-scale battery technology and economies of scale continue to improve, many utilities are investigating the use of battery technology as the basis for Grid Energy Storage Systems (GESS). AusNet Services, the largest energy delivery service in Victoria, Australia, trialed GESS technology to explore the benefits to peak demand management, power system supply and stability, and network investment deferral that a large-scale, grid-connected microgrid can provide. 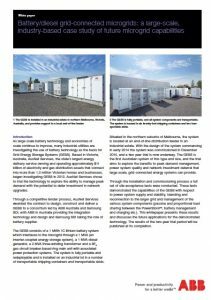 Battery Technology and Grid-Connected Microgrids. Download it now. Following a full set of site acceptance tests, the capabilities of this grid-connected microgrid shows promise for future microgrid applications. This white paper presents these results and discusses the future applications for the demonstrated technology. The GESS, the first Australian system of its type and size, was installed in an industrial estate in northern Melbourne where it provides support to a local end-of-line feeder. ABB in Australia provided integration technology and design for the AusNet GESS, while Samsung SDI took the role of battery supplier. The fully portable system is housed in six twenty-foot shipping containers and two transportable skids, allowing it to be positioned near to customers. AusNet studied the effects that embedding the generation source close to the load would have on postponing network investment involved with upgrading feeder lines to support increased loads. This whitepaper presents the results of the AusNet GESS study and discusses future grid connected microgrids. 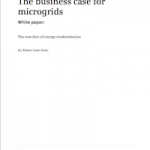 Detailed results are available for download from the Microgrid Knowledge White Paper Library.